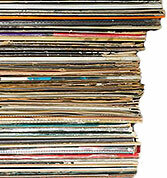 We transfer LPs, 45s and 78s to digital too. 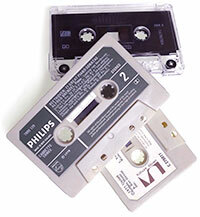 Looking for a way to save and restore your old records, audio cassettes and tapes? We can do that for you, using the very best, totally rebuilt studio-grade equipment. We will transfer everything, track by track. We'll process and clean up your audio too and give you back your precious recordings on DVD or almost any popular digital audio file format ready to play. If you need editing, or custom post-transfer work, we can do that too. With our completely rebuilt Revox B-77, B710 and Akai tape decks, we can extract the very best possible analogue to digital transfer from all your audio tapes. We can handle single, dual and four channel tapes running at 15, 7.5, 3.75 and 1.875 inches per second tape speeds. We can mix to 16-bit 48KHz Blu-ray quality or record direct to file at full studio-quality 24-bit 192KHz via our Roland Audio Interface for the very highest quality sound. We are constantly surprised by the number of audio cassettes customers bring us, often in good condition. To get the best audio quality, a top class playback device is required. 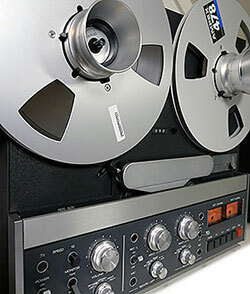 Our Revox B710 has one of the best tape transports in the business and coupled with the audio processing software we use to reduce tape hiss, we can get excellent sound quality. You'll get your recordings back track by track on DVD or as WAV/MP3 files ready to play at home or on your portable device. We have fully serviced Sony DAT and Tascam DA-78HR tape decks in house for transferring DAT and professional 8-channel DTRS 16 and 24-bit tapes also. Both pro studios and consumers have moved to pure digital, leaving valuable recordings high and dry for want of a suitable tape transport. We can help rescue DAT and DTRS audio, so get in touch if you think we can help! Have you got old LPs, 45s and 78s in your collection that you'd like to preserve? Bring them to us and we'll convert them to the digital audio format of your choice, using the very best phono and AD equipment. Obviously we'll carefully clean your records first. We'll play them only on first-rate phono equipment, transfering and filtering your audio for the best possible sound. We use the best analogue to digital interfaces available and you'll get your music back as top grade digital files, track by track, ready to enjoy again. 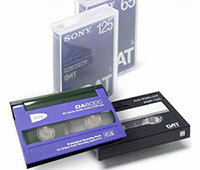 Pricing - Tape, Record and Cassette, DAT & DTRS (Hi-8) 8-channel Transfers Due to variations in audio tape format, length and speed, we are not able to provide pricing here for every eventuality. The following prices are ex-GST and are indicative. Note we will only charge you for recorded runtime. Blank tapes will be returned without charge. Courier your tapes, or bring them in! Sorry, we don't have an on-line estimator for audio work. Just give us a call on 0800 474748. If you are local, you are welcome to visit but please call us first to fix a time. We'll be able to give you an estimate on the spot. Not sure about something? Visit our Help and Assistance pages. You'll find detailed support on our film, photo video and cine film scanning services and samples too. Or, just call us on 0800 474748 or email customerservice@filmscan.co.nz for help.